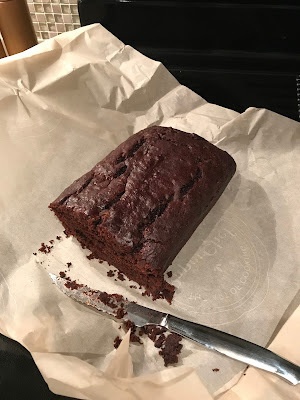 So, it turns out there are banana breads I hadn’t made yet – one of them being this double chocolate banana bread from Smitten Kitchen. As is the case with all banana breads, it is easy to make and incredibly satisfying first thing in the morning. And with all the chocolate, it’s obviously an easy sell with the kids. Give it a try! Preheat the oven to 350 °F. Butter a 9×5-inch loaf pan, or spray it with a nonstick baking spray. In a medium bowl, sift together the flour, cocoa, baking soda, and salt. (My cocoa is always lumpy, so I think sifting it is essential.) Whisk together and set aside. Mash bananas in the bottom of a large bowl. (You’ll have a little over 1 cup mashed banana total.) Whisk in melted butter, then brown sugar, egg, and vanilla. Stir dry ingredients into wet ingredients with a wooden spoon until just combined. Stir in chocolate chunks or chips. 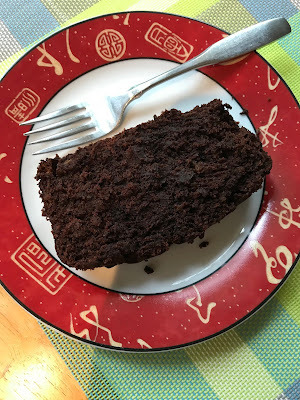 Pour into prepared pan and bake 55 to 65 minutes, until a tester or toothpick inserted into the center of the cake comes out batter-free, though a smear of melted chocolate is normal. Cool in pan for 10 to 15 minutes, then run a knife around the edge and invert it out onto a cooling rack. Serve warm or at room temperature.